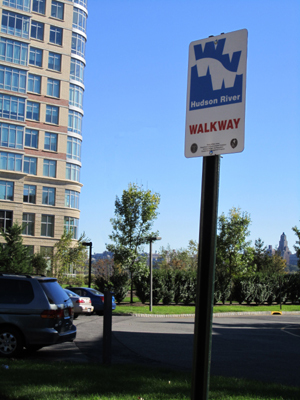 There is no walkway between Citi Place and I-Park in Edgewater. A Superfund site called Quanta Resources is being remediated before development and walkway can be built. See the May 2018 update here. The Hudson River Waterfront Walkway is a spectacular pathway on the western shore of the Hudson River in New Jersey. The state has planned the Walkway to exist immediately adjacent to the river in a continuously connected 30 foot wide path from the tip of Bayonne to the George Washington Bridge. The Walkway provides free access 24/7 for the enjoyment of the general public. The Hudson River Waterfront Conservancy is the organization dedicated to monitoring the completion and consistent maintenance and upkeep of the 18.5 linear mile plan. Among its goals are the preservation of the scenic values afforded by the walkway and the implementation of the State rules and regulations concerning the development and use of the Walkway.